The readers of Parade magazine once voted Carl Sagan the smartest man in America. Many historians say Benjamin Franklin is the greatest mind this country has ever seen. 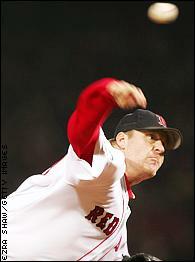 But those two clearly take a backseat to Curt Schilling, Boston's ace pitcher and postseason hero. Schilling knows everything. 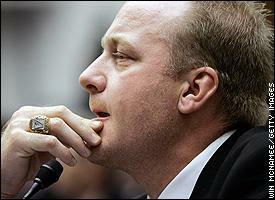 Curt Schilling -- just a pitcher? You don't know the half of it. Don't believe us? Just listen to him. In fact, Page 2 just got wind of Schilling's soon-to-be self-published book, "Curt Schilling's Guide to the Galaxy." In it, he's apparently going to tell us about ... well, everything. Everything, that is, that he hasn't already told to us about politics, Alex Rodriguez, Lou Piniella and Mystique and Aura. Oh, and that he can't think of anything more enjoyable than making 55,000 people from New York shut up. Page 38: On dealing with the media. Writes Schilling, "The key is to always be accessible. Driving in to the ballpark? Call the sports talk radio station. Icing your arm after a game? Post some comments on the Sons of Sam Horn Web site. Know the cell-phone numbers of Peter Gammons, Jayson Stark, Buster Olney, Tim Kurkjian, Tom Verducci, Murray Chass, Ken Rosenthal, Hal Bodley, Geraldo Rivera, Pat O'Brien and Bill O'Reilly. Call them at least once per day, especially O'Reilly so you give him suggestions for his show. Make sure you have the e-mail addresses of the top 300 corporate CEOs and all the important congressmen. Give them great sounds bites. Use words like 'idiot' and 'shut up.' Don't be afraid to take a stand. Be willing to do postgame interviews, even if it's with Tim McCarver. And if you're in San Diego for business, for example, bring out that Drew Brees jersey. The locals will eat it up." Page 84: On Tom Cruise's love life. Writes Schilling, "This guy proved in 'Top Gun' that he's one of cinema's greatest artists, but I just don't understand what he's doing with his love life. He divorces the lovely Nicole Kidman, dates Penelope Cruz, and then starts up with Katie Holmes. I think he's forgotten how the dating game is played. There's just too much of an age difference between him and Katie. It's a bad PR move." If you're reading this with Barry Bonds, tell him to look away. Page 126: On pitching to Barry Bonds. Writes Schilling, "A little dab of blood placed across the stitches of a four-seamer is an excellent way to fool a great hitter like Barry Bonds. First, the batter picks up the blood's red color and confuses it with the stitching, so he misreads the pitch. Now, a great hitter like Bonds will subsequently realize that it's human blood on the ball. Two years ago when I bloodied a pitch to Bonds, he actually vomited before the pitch crossed the plate. That's how much blood sickens him and that's how fast his reflexes really are. "Now, if you're pitching in a crucial game, say Game 6 of the ALCS against the Yankees, you may need a little extra blood. A bloodied four-seam fastball will move quickly from up and in to down and away. It's an almost unhittable pitch. Even somebody with a quick bat like Gary Sheffield can't touch it." Page 141: On hair loss. Writes Schilling, "When one begins balding, it's best to try to hide it by still spiking up your hair '80s-style." Page 151: On the War on Terror. Writes Schilling, "Everyone is going about this all wrong. Where's Osama bin Laden? He isn't in jail. I'd know. I surf the Web all the time and believe me, I would have read about it. I'm not even going to get into all the things that need to be done differently  that's a whole different book. But let me just tell you that I've been playing lots of video games  the Medal of Honor series, Splinter Cell, SOCOM ... you name it. Not only that, but I own hats commemorating two different battleships in the U.S. Naval fleet and I watch the History Channel three hours per day. So I know what's up. And I know how to fix it." Page 187: On the Los Angeles Clippers. Writes Schilling, "I watch a lot of NBA games during the offseason, and let me tell you what's wrong with the Clippers: Elgin Baylor has somehow forgotten how the game is played. Some of their players were saying that Elgin makes them spread their own mayonnaise on their postgame sandwiches. They told me, 'This is why we lose 50 games every year, because this idiot makes us do stuff like this.' "
Page 211: On career advice. Writes Schilling, "If your team isn't winning ... leave. Even if it means committing support to either side of a bitter rivalry. Hey, charity starts at home." In front of his locker, or Congress, Curt is always willing to share his knowledge with the world. Page 234: On "American Idol." Writes Schilling, "As far as I'm concerned they already had the real 'American Idol' contest last November, and the right man won. Why is America all acting like idiots voting for a bunch of second-rate lounge singers? Plus, that dude Anthony Federov, the one with the tracheotomy scar, kind of freaks me out. Someone needs to buy him a turtleneck. Not that I watch. I overheard Damon and Bellhorn talking about it." Writes Schilling, "Ask not what your country can do for you. Ask me. And bring a TV crew." Writes Schilling, "Many people forget that I told NASA scientists about the data I calculated from the Indonesian earthquake that showed it affected the Earth's rotation, decreased the length of day, slightly altered the planet's shape and shifted the North Pole by a few centimeters." • He knows to stand next to David Wells in the team photo so he'll look slimmer. • He knows where Jimmy Hoffa is buried. • He knows why Dunkin' Donuts coffee is much better than Starbucks'. • He knows why J.D. Salinger stopped writing. • He knows where to get the cheapest gas. • He knows to the exact millimeter how close a pitch can come to a batter's head to be playing the game the right way and not inciting a brawl. • He knows which mysterious residue stained Trot Nixon's hat. • He knows that Clorox is the best bleach for removing blood stains from socks. • He knows how many jelly beans are in the jar at the local drug store. • He knows what time Aura and Mystique appear on the main stage. • He knows how to save on car insurance without switching to Geico. • He knows who to vote for in the races for Boston City Council. • He knows what's really going on with Brad and Angelina. • He knows that Lou Piniella has a 5 o'clock shadow at noon because he's too dumb to know to shave against the grain of hair growth instead of with it. This soon-to-be best seller proves one thing  the only thing Curt Schilling doesn't know is when to shut up.